John Saunders reports: Today was a momentous day in chess and the end of an era as the last of the ‘Great Ks’ of the turn of the century, Vladimir Kramnik, decided to quit the stage, but perhaps the start of a new Russian era as two young players from the strongest chess-playing country in the world shared the lead with a player from the Czech Republic. At the end of the day’s play David Navara, Vladislav Artemiev and Kirill Alekseenko shared the lead on 6½/8, with twelve more players tucked in behind them on 6 points: Maxime Vachier-Lagrave, Levon Aronian, Yu Yangyi, Hikaru Nakamura, Nikita Vitiugov, Maxim Matlakov, Ivan Saric, David Howell, Le Quang Liem, David Anton Guijarro, Murali Karthikeyan and Babu Lalith. Ju Wenjun and Mariya Muzychuk lead the race for the women’s first prize on 5½. The announcement of Vladimir Kramnik’s retirement after his poor showing at the Tata Steel tournament in Wijk aan Zee was perhaps not a great surprise as he had already hinted at it, both verbally and in the devil-may-care way he had started to play chess, on a number of occasions. There are also a couple of indicators in the previous paragraphs when we consider the age range of the front-runners in this tournament, with very few of them over 30, let alone 40. 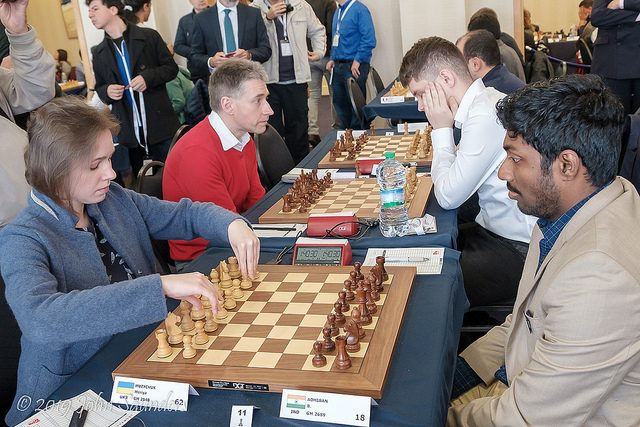 However, the advance of two young Russians in Gibraltar might soften the blow for the world’s most powerful chess nation as they cast around for replacements to maintain their status in the game. Who knows, one day we might be talking about the great Russian players whose names begin with ‘A’ just as we now look back in admiration at the ‘Ks’ – Korchnoi, Karpov, Kasparov, Kramnik, etc. Vladislav Artemiev we already know something about, despite his tender years (he turns 21 in March), as he has already passed the watershed 2700 mark and scored some significant tournament successes, but I confess Kirill Alexeyevich Alekseenko was a completely new name to me before this tournament. He’s a year older than Artemiev and some 60 points short of him in rating terms so he has passed under the radar until now but he is clearly talented. And there is no better place to showcase young talent than Gibraltar. 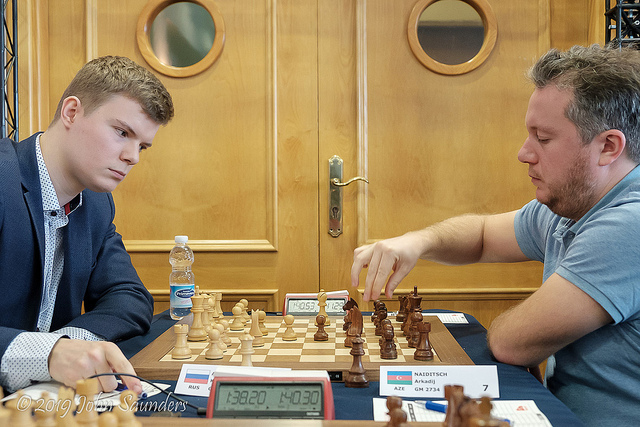 The game of the day was Kirill Alekseenko versus Arkadij Naiditsch. This was by no means an error-free game but, let’s face it, very little chess is these days when placed under the merciless microscope of ever-improving analysis engines. But it was a full-blooded encounter with plenty of cut and thrust, reflecting well on the fighting quality and imagination of both players. Arkadij Naiditsch is one of the toughest open tournament competitors of our era, as evidenced by his share of first place at the ultra-strong Chess.com Isle of Man International last October, so to beat him in a major event such as #GibChess is quite an achievement by Alekseenko. 1.e4 e5 2.Nf3 Nc6 3.Bb5 Nf6 Playing the Berlin in homage to Kramnik on the day he retired? Probably not. Anyway, this transposes into something un-Berlin-like, more of a Steinitz Defence. 4.d3 d6 5.0‑0 Be7 6.c3 0‑0 7.Re1 a6 8.Ba4 Bg4 9.Nbd2 Nd7 10.h3 Bh5 11.Bc2 Kh8 Various moves have been played here before but nobody has felt the need to park the king in the corner. 12.g4 Bg6 13.Nf1 Nb6 14.Ng3 d5 15.Qe2 f6 16.h4 Bf7 17.h5 dxe4 18.dxe4 Bc4 19.Qe3 Nd7 Backtracking with the knight seems a little odd. Maybe 19...Be6, requiring White to do something about the threat to g4 was in order. 20.Nh4 Bc5 21.Qf3 Rf7 22.Bb3 22.Rd1 or 22.Ngf5 look more to the point here. 22...Bxb3 23.axb3 Qe8 24.b4 Bb6 25.Ngf5 Nf8 26.Kh2 Engines want to cut to the chase with 26.g5!? fxg5 27.Bxg5 but after 27...h6 28.Ng6+ Kh7 the claimed advantage looks a little nebulous to the human eye. 26...Ne6 27.Rg1 Ng5 28.Qe2 Nd8?! A pawn sacrifice, but it’s not clear what it is supposed to achieve. Anyway, it soon meets with some forthright counterplay. 28...Qe6 looks playable. 29.Bxg5 fxg5 30.Nf3 Ne6 31.Nxe5 Rf6 32.Nd3 g6 33.hxg6 hxg6 34.Rg3! Perhaps Black thought he was forcing the knight back, e.g. 34.Ne3 after which he good compensation for the pawn, but White has aggressive intentions of his own. After this the position becomes a wonderful mess, with both players struggling to calculate all its nuances. 34...Kg8 If 34...gxf5 35.Rh3+ Kg7 36.gxf5 and Black suddenly finds himself in terrible trouble. If the knight retreats, the a1‑rook comes to g1 and it is as good as over, and even if Black sacrifices back, he’s still struggling. 35.Rh3 Stockfish 10’s move of choice is 35.Rh1! when the g3–rook is kept in reserve should Black be foolhardy enough to capture on f5, and getting ready to unleash mayhem down the h-file after moving the king out of the way. 35...Rd8! This underlines another weakness of White’s last move as Black can answer some of his moves with an exchange sac on d3 and then follow up with a fork on f4 which wouldn’t have been the case were the rook still on g3. 36.Rh1 Rxd3! Black finds his best defence. 37.Qxd3 Not 37.Rxd3? Nf4 and it’s all over for White. 37...Nf4 Black should now play 37...gxf5 with subsequent play resembling the game, e.g. 38.gxf5 Nf4 39.Kg1! Bxf2+! (39...Nxh3+? 40.Qxh3 wins for White) 40.Kxf2!! (Forced since 40.Kf1 Nxh3 41.Qxh3 Bh4! brings down the portcullis on White’s only entry to the black fortress.) 40...Nxd3+ 41.Ke3 when White’s two rooks still wield enormous power despite the material deficit. Black is obliged to find 41...Rf8! 42.Rh8+ Kg7 43.R1h7+ Kf6 44.Rh6+ just to escape with a draw since 44...Ke5 loses to 45.Rxf8 followed by 46.Re6+ winning. 38.Kg1? 38.Qc4+! is the right move though, after 38...Qe6 39.Qxe6+ Rxe6, it requires White to find 40.Rh6! when 40...gxf5 41.Rxe6 Nxe6 42.gxf5 and White has more than enough material for the two minor pieces. 38...Bxf2+! Black’s only move to save himself, and it might even win. 39.Kxf2! White has to capture and surrender his queen with check since the bishop would otherwise swing back to h4 and close the file to the king. 39...Nxd3+ 40.Ke3 Rf8 The only way to defend himself. Now White has to find something to justify his rook for queen sacrifice. Alekseenko looked rather glum at this point so he wasn’t convinced himself. 41.Ne7+ Kf7 41...Qxe7 42.Rh8+ Kf7 43.R8h7+ Ke8 44.Rxe7+ Kxe7 45.Kxd3 is just a draw but Black wants more. 42.Nd5 Qd8?? A blunder. Instead 42...Qe5! 43.Rh7+ Ke8 should win for Black, e.g. 44.Re7+ Qxe7 45.Nxe7 Nf2 46.Rh7 Nxg4+ 47.Kd4 Nf6 48.Rg7 Rf7 and the black pawns triumph. 43.Rh7+ Ke6 44.Kxd3 Rf3+? 44...Rf7 looks a more straightforward route to a draw. 45.Kd4 Rf4 46.Re7+ Kd6? After this it is gone. Black had to take his chances with 46...Qxe7 47.Nxe7 Kxe7 48.Kd5 Rxg4 when he might salvage a draw with a bit of luck and a following wind. 47.Rhh7 c6 48.Nxf4 Qb6+ 49.Kd3 1‑0 49...Qb5+ 50.c4 Qxb4 51.e5+ Kc5 52.Ne6+ Kb6 53.Rxb7+ wins. As to the other major pairings: Aronian-Artemiev morphed into a Grünfeld, with White pressing in the middlegame but being comfortably held at bay by Artemiev. Le Quang Liem-Vachier-Lagrave was another Grünfeld, following a previous MVL game (but with him playing White) for some distance. For much of the course of the game, the Frenchman laboured on a pawn down but it was one of those pawns that elite players don’t seem to worry about because they’ve already figured out that the resultant endgame would be drawn or that they can stop the opponent improving their position. Eventually it just fizzled out to a draw. Matlakov-Yangyi was an unusual English opening which exited the book very early. The position remained blocked and the game never quite caught fire. Navara-Grandelius was a possible contender for game of the day but not quite so exciting. After a Bb5 Sicilian, Navara won a pawn around move 20 which might have fallen into the category mentioned above in which the defending GM might be relatively relaxed about losing it since a number of positional factors made it of lesser importance. This seemed to be the case at first but Navara thought otherwise. He gradually outplayed his opponent to the point where the extra pawn made a lot of difference and decided the result. 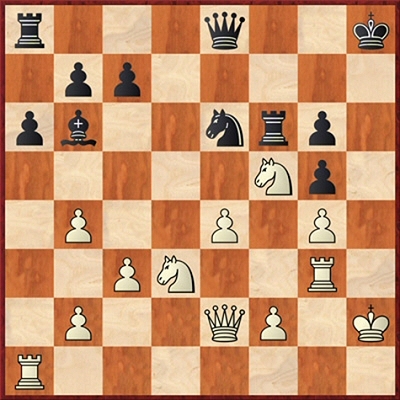 Vitiugov-Saric was a London System, which has the reputation of being relatively mild, but here White was soon giving his opponent the Harry the h-pawn treatment for a very promising attack. But Black found a way to give up a pawn to get the queens off and thus defuse the attack, and then placed a rook on the seventh to give full compensation for the pawn. Hikaru Nakamura can normally be expected to come roaring back after a loss and this was no exception. He too favoured Harry the h-pawn, which he launched against Rasmus Svane’s Caro-Kann. The analysis engine disapproved of some of his methodology and the German GM might have improved his play markedly at one or two junctures but once Nakamura had established a knight and then a pawn on d6 there was only going to be one result. Mariya Muzychuk kept up her challenge for the top women’s prize with a draw against Baskaran Adhiban. She is on 5½ but has now been caught on the same score by women’s world champion Ju Wenjun, who beat IM Zan Tomasini of Slovenia. On 5 are Humpy Koneru, Lei Tingjie, Antoaneta Stefanova, Anna Muzychuk, Tan Zhongyi and last year’s women first prize winner Pia Cramling. Round nine takes place on Wednesday at 15.00 local time (GMT+1).